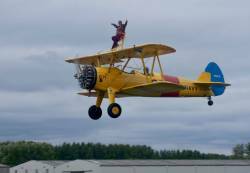 On Sunday 16th September, I travelled to Selby in Yorkshire in order that I could participate in a wing walk for Claire House children’s hospice in Clatterbridge on the Wirral. I had to wait quite some time for the sun to appear but it did eventually and my wing walk commenced. What a lovely feeling riding high above the trees watching the scenery go by. I have managed up to now to raise over £1,100 for Claire House and would like to thank some of my fellow colleagues from the Western branch who supported me on my venture. Thanks guys!